An upgraded top and all the features that make the series easy to play. 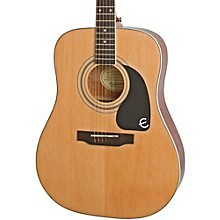 The PRO-1 Plus comes with a Solid Spruce top for superior sound with beautiful 5-layer Ivory and Black binding just like Epiphone's vintage classics and features all of the PRO Collection's breakthrough innovations. Epiphone, one of the world's oldest and most respected guitar makers, has just made playing and learning guitar easy for everyone. Creating a truly easy-to-play guitar wasn't easy. Epiphone takes making a great guitar seriously, no matter what the player's level. So Epiphone rethought the guitar from top to bottom to make an instrument that anyone can play right away. The result is a truly "PRO" guitar that's easy-to-play, easy-to-own, and most importantly, delivers the full, vibrant sound that Epiphone is known for. 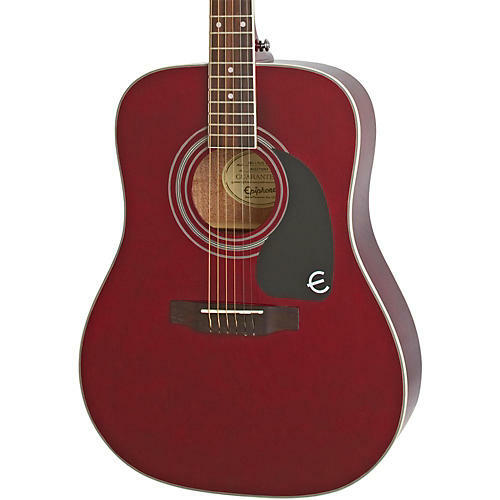 The PRO-1 Plus acoustic guitar is the result of exhaustive analysis, numerous technological innovations, and suggestions from a "who's who" of professional players. Wrap your hand around the PRO-1 Plus neck and you'll immediately feel how comfortable it is. The new EZ-Profile neck is designed so your hand can easily form chords without feeling fatigued.